Tissue-Tek® Process/Embedding Cassette Made from chemical resistant plastic. These disposable plastic Cryomolds produce a uniformly shaped flat surface specimen block with tissue freezing medium （O.C.T.） for frozen sectioning, Standard Cryomold fits directly into Cryobar® freezing wells of the Tissue-Tek® II microtome/cryostat. Use a Cryomold® adapter to adapt smaller biopsy and intermediate Cryomold® molds to freezing wells on the Cryobar® unit. A reusable brass thermal conductive holder with an embossed surface for the Tissue-Tek II microtome/cryostat and for conventional procedures for frozen tissue embedding. Plastic Cryomold®, round shapes with a tab for easy handling. Available in standard and biopsy configurations. 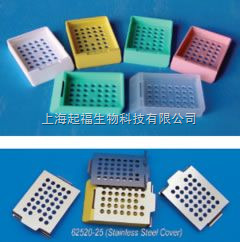 The standard mold measures 22mm （D） x 5mm deep. The Biopsy mold measures 15mm （D） x 5mm deep. Machined from solid aluminum with an embossed surface for holding frozen embedding blocks. Measures: 26mm top diameter （without ‘O’ ring）, 28.55mm diameter with ‘O’ ring, 23mm body diameter, 16mm height . Molded from the highest quality plastic, our Embedding Rings fit most base molds. For added convenience, there are four colors from which to choose （Blue, Pink, Green, Yellow）. The large writing surface further eases identification and handling. The base measures 1 5/8" x 1 1/8" and the ring measures 1" x 1" （25 x 25 mm）. Paraffin tissue microarrays （TMAs） are becoming more common in the laboratories. Current techniques including organizing, punching, and inserting tissues is time consuming and involving costly equipments.This Arraymold is the simple tool but great answer for this current technique for laboratories to perform TMAs with less time consuming, excellent results. Rubber arraymold can be reused many times without losing its flexibility. 1 DVD instruction （NTSC） for showing how to use the mold. Made from stainless steel and has a positive clip-on cover. It is ideal for processing micro specimens. It can be used as a holder for paraffin sections while removing paraffin wax. Available in medium and fine mesh. It measures: 20mm（dia.）x 5mm（deep）. Made from stainless steel and comes with a positive snap cap. They are expandable. When closed its dimensions are 40mm（dia.）x 7mm （deep） and can be expanded to 11mm deep. Perforated top and bottom. A three-compartment divider which is removable for specimens up to 35mm. Accuray machined chrome plated aluminum discs that fit most microtomes and cryostats. They have a knurled surface for better specimen handling. Straight shank. Available in a variety of disc sizes. The 38mm（Dia.）x8mm（Deep） are intended for use with normal tissue. Due to the amazing demand from of our customers, EMS is re-introducing the original Paper Biopsy Bags. These bags are made from porous paper which provides maximum tissue safety during processing. The bags permit proper fluid exchange and drainage. To Use: Simply introduce the specimen into the bag and fold its end, enclosing the cassette or capsule â€“ you are now ready to process as usual. Made from nylon cloth, 0.2mm mesh diameter. All seams are heat-sealed. They fit all process/embedding cassettes such as 70025 and 72025 as well as Uni-Cassettes （62500）. These two "L’s" shape and stainless steel base plate form an adjustable embedding mold, suitable for embedding various size specimens with a minimum of waste material. Available in 5 different sizes. Precisely machined from hard phenolic resin . New and improved. The Super PAP Pen outperforms the original PAP Pen. The Super PAP Pen may be used at temperatures as high as 120°F. （The old style PAP Pen worked only up to 90°F）. With this high temperature feature, one can now use the Super PAP Pen to perform the peroxidase-anti-peroxidase method, ABC method, and Fluorescent antibodies method with satisfactory results. The Aqua-Hold Pap Pen draws a liquid repellent barrier around a section of tissue. Used like a paint pen, you just draw a well on a slide. The barrier creates the proper surface tension to hold aqueous solutions such as costly antibody and other valuable specimens. After application, the barrier material is insoluble in alcohol and acetone but can be removed after staining with xylene. Each pen holds 13ml of long-lasting material, making hundreds of wells. The EMS Tissue Capture Pen is a coating pen with a wide point （18mm） for fixing various tissue sections （paraffin embedded, frozen and formalin sections, etc.） The unique pen is unaffected by heat up to 120ºC so it offers secure and firm adhesion of the tissue section. It may be used in Microwave staining, immunostaining, in situ etc…. The EMS Tissue Capture may be used in conjunction with our Pap-Pen （ 71310） and will allow for easy placement of adherent as well as nonadherent cells on a glass slide. Immunostaining/ISH can be performed by applying a few drops of tissue suspension or liquid media onto the glass slide which is circled by the Pap-Pen, and then your section can be placed.